Have you ever thought about what book served as your gateway drug into the world of YA literature? I've been thinking about that a lot the past few days while I read Julie Kagawa's The Immortal Rules. I think a lot of people in my age bracket will say that books from the Harry Potter series and Twilight Saga were the the first YA books that captured them and honestly, I come from a very similar path. As a high schooler, I loved the Harry Potter books, but I was otherwise very anti-YA. For some reason, I was actually kind of a literature snob. I loved anything complex, the classics, anything that was very literary and deep, but besides Harry Potter books, I stayed far away from anything that could've been construed as YA or even contemporary. But in 2008, while I was coaching my first group of high school cheerleaders, I noticed they were all bringing these Twilight Saga books to practice. When I learned I needed to have surgery, I decided that I would give them a whirl while I was recovering. I fell in love with them quickly and when I finished, I sought out more YA. I landed on all of Rick Riordan's books next (Percy Jackson and the Olympians, The Kane Chronicles, Heroes of Olympus). But then I kind of fell a little flat with the YA stuff and I couldn't find anything that really resonated with me. I wanted something more like what I'd already loved, but most everything I tried felt like a rip off of Harry Potter or Twilight. In December 2011, I got a Nook for my birthday and when I was searching for some bargain books, I stumbled on Julie Kagawa's Iron Fey series. The first book was only $3.99 that night, so I purchased it and gave it a chance. I was totally enchanted by them and couldn't get enough. Today, those books are at the top of my all-time favorites list. They hold a special place in my heart as the first YA series that I "discovered," in that they weren't recommended to me by anyone else, they were just something I found. In one of my media classes, we read in our textbooks and discussed the topic of reading, and how it's the most private and personal form of absorbing communication there is. Because all of our imaginations are different and unique, we all interpret stories differently, imagine them individually, and create our own visualizations that we can't directly pass on to another person. And that's how I feel about these books: They were deeply personal to me. When I learned about Kagawa's Blood of Eden series, I was curious but cautious. At that point, I'd gone through some YA flops trying to find something that gave me the same kind of "Twilight feels" but wasn't a rip off. I wasn't really into picking up another vampire series. I didn't want anything to ruin my relationship with Twilight or change the way I saw those vampires. I bought The Immortal Rules last spring, but I only got about 50 pages in and it then sat on my Nook for the past year. But this past fall, I received an ARC from Little, Brown Books for Young Readers called The Coldest Girl in Coldtown by Holly Black. It too was a vampire novel. But it was receiving so much high praise that I decided to give it a try, even though I was convinced I didn't have the room for anymore vampires in my life. I learned from reading that book that I was so, so wrong. And that book easily became my favorite book of 2013. And so this spring, as I've been preparing for BEA and once again meeting the fabulous Julie Kagawa, I decided to go back to The Immortal Rules and come at it with a new, open perspective. And I'm so glad I did, because it was all kinds of awesome. What I loved most about it is that it didn't remind me of anything else I'd ever read. I hate it when I feel like books are comprised of pieces of other books and series and aren't original enough in their own right. The Immortal Rules has uniqueness in spades. It's dystopian and paranormal with a focus on vampires, but there are also other creatures, like the rabids, humans and animals affected by a hybrid virus made up of the Red Lung disease that wiped out a good portion of the humans on the planet and vampirism. This combination came together when scientists, trying to prevent the spread of the Red Lung and its destruction, attempted to turn those Rabids into vampires as a way of circumventing the illness. Instead, it spawned a whole new disaster. In Kagawa's dystopian society, vampires now rule what remains of the former United States of America. But even their numbers are depleting as they come up against the rabids. Humans are in more grave danger than ever, from both the vampires and the rabids, and in this world, there is only one safe haven from all of it: Eden. A 100% human civilization with technology of old, where human refugees seek solace from the current state of vampire-related affairs. Once I really got back into it, it only took me a couple of days to finish The Immortal Rules, and it would've been sooner if I'd brought my book out with me the past two days while I was roaming the city. I probably would've finished it on the subway. It looks like a really beefy book, but it's actually quite the quick read. It moves at a great clip and I found that Kagawa used a lot of literary devices to make the storylines deeper, richer, and more complex than other vampire and YA novels out there. What I loved most is that Allie found a way, despite being told that she couldn't, to maintain her humanity, even once she had turned. She was able to reconcile the way most humans would feel about her, but she still sought to be different than the monsters she knew, she still fought to hang onto a fraction of her human-self, and I found that to be really refreshing and unique. As a vampire, it's like she became the strong young woman she was meant to be that she might not have lived to be if she remained a human, even if she hadn't been attacked in the first place. I also really enjoyed the development of the relationship between Allie and Zeke. It felt authentic and original and not like a ripoff of Twilight, which it easily could've been. I loved Allie's compassion for his band of followers and for her deciding to follow them to protect them, even though they'd cast her out. Despite the lack of a beating organ to serve as a heart, Allison clearly still had one and in truth, was no real monster. I loved watching Zeke see that in her and I hope that they eventually reunite. I have The Eternity Cure, so I'm excited to see how the next installment plays out. 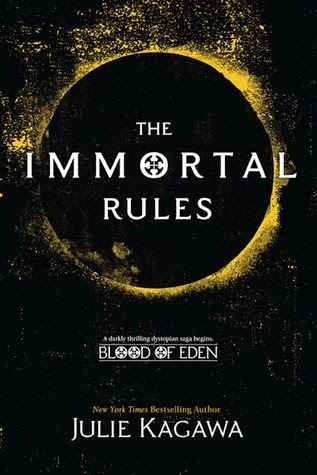 I thought The Immortal Rules was incredibly strong for being the first novel in the series. But the world building was superb, the character building was interesting and successful, and yet there still remains immense room for growth. I gave the book a full five hearts!